If you want to get rid of louse eggs on chickens, you might have to become a literal nit-picker. Nits are the eggs usually found on the feather shafts of infested birds. You can try removing the nits by hand or wait until the eggs hatch and eradicate the lice with the proper pesticide. Lice infestations most often occur in autumn and winter. Chicken lice don't usually bite, but feed on the feathers and skin. If the chicken incurs a wound, the lice will feed on the blood. Even if you don't see lice on your birds, suspect an infestation if they appear "moth-eaten," with dull plumage. Birds with trimmed beaks are especially vulnerable, as chickens with full beaks can remove many lice and nits from their bodies. Chicken lice are species-specific, so don't worry about getting them on you. Chicken lice are small, flat, yellowish and wingless. It's probably easier to see the nits on the feather shaft than the actual lice. These clumps of white eggs, numbering between 50 and 300, firmly adhere to the feather's base. The eggs hatch within a week after the female louse deposits them. Lice usually lay eggs in feather shafts near the bird's vent, so concentrate your search around the chicken's hindquarters. You'll find actual lice underneath the bird's wings and around the breast and head. If your bird has only a small amount of nits at the feather base, you can try removing them by hand. Prepare a bucket of warm, soapy water. Hold the chicken upside down and, using a sponge, wet the area with nits to help loosen them. 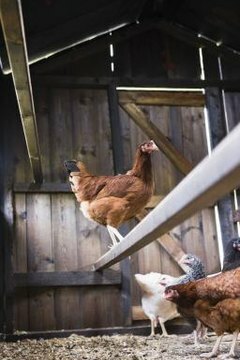 If your chicken is calm and easily handled, you might not have to hold her upside down, but frightened birds will go limp when held that way. Using your fingernails, hand pick the eggs off the feather base. You can purchase pesticides for treating chicken lice from your local farm supply store. Powdered formulas allow you to dust your chickens. Since lice are so easily transmissible from bird to bird, you must treat your entire flock. The Ohio State University Extension website recommends placing the louse powder in a garbage bag, then putting the chicken in the bag with his head sticking out. Shake the bag so the dust covers the entire bird -- but wear gloves and a mask. Since lice live approximately two weeks, repeat the process at that time to get rid of any nits that have since matured. You must also clean your hen house thoroughly and treat it with louse powder.